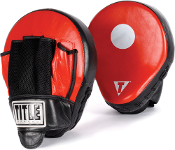 Take a step up with these new Incredi-Ball Contoured Training Mitts! More than 2.5" inches of multi-layer impact resistant foams to take every strike and beg for more. A full grain leather cover seals the mitts for years of professional service. Includes a half ball palm grip inside affords anatomically correct comfort, shock resistance and longevity. Advanced moisture wicking lining helps repel sweat and keep trainer cool. Complete with leather wrist security strap with hook-and-loop closure for snug fit.